For some recipes the "Now active" bar is not shown. The ones I added for my Onkyo (music, radio) work, and is shown from the main screen. But for PS4 and Kodi (added with Kodi driver) there is none. Not sure how that work, what makes the "Now active" bar kick in? Added some pics of what I mean. In the last picture is the PS4 recipe active. Michael Rydén As visible form your screens you build these recipes from scratch, in the current firmware there are issues knowen that are then leading to the fault you have here. secondly if you build your recipe from scratch and use the show controls of and use volume of with two different defices it is causing the issue, that the device which shows the controls are also used to control volume. There is a workaround around that by using automatically generated recipes, but therefor you need to add your Target device (TV, Beamer, Projector, ...) multiple times, which then brings up automatic recipes that need to be manually adjusted. This then leads to annother issue which you allready also see, the showing of multiple active recipes that are all using the same Equipment. Markus Mahr Not sure if I grasp all of it, but I'll give it a shot. The two that shows are actually the same device (added three times), my Onkyo has a streaming service (Spotyify, TuneIn, Deezer etc) and radio. Didn't find any other solution but to add a new device for each thing I wanted, and a "generic" for the main sound output from other devices. I just have one device that controls the volume, the Onkyo receiver. 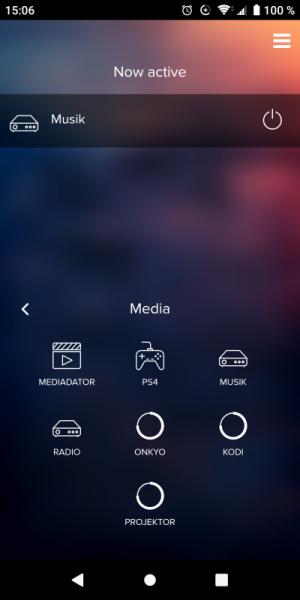 For all of the recipes I have added controls, including Kodi (called Mediadator on the pics) and PS4. To access the controls I had to make a workaround and just added a recipe that just shows the controls for some devices. For Radio and Musik I can just press the black bar on the top. Michael Rydén can you provide pictures of the recipes you created? That would make it much easier to see then to read back an for and talk away from each other. I just got this problem for my Apple TV recipe after updating to 0.53.8. Never had it before. I have restarted the brain with no change. Same problem on remote and iOS app. Solved it by deleting and adding Apple TV device. Rewire did not help.